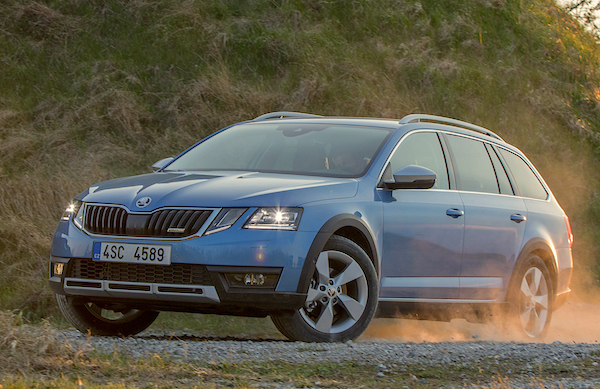 The Skoda Octavia is the best-seller in Finland in July and 2017. In July the Finnish new car market is up 5.8% year-on-year to 8.705 registrations, yet the year-to-date tally remains in negative territory at -0.9% to 72.308 units. Toyota shoots up a spectacular 55% on July 2016 to 13.3% share, distancing Volkswagen at 11.2% (+12%) and Skoda at 9.1% (-4%). In the remainder of the Top 10, Volvo (+25%), Kia (+21%) and Mercedes (+28%) shine but Ford (-18%), Opel (-21%) and Nissan (-39%) struggle. Further down, notice Peugeot (+29%), Seat (+35%), Mini (+39%), Suzuki (+46%), Lexus (+50%), Dacia (+80%), Land Rover (+92%), Porsche (+467%) and Alfa Romeo (+525%) all posting spectacular gains. Model-wise, the Skoda Octavia (+3%) continues to lead the way and is followed this time by three fast-advancing nameplates: the VW Golf (+63%), Toyota Yaris (+61%) and Auris (+32%). The Kia Rio (+27%) and Toyota Avensis (+29%) also post robust improvements whereas the Ford Focus (-20%), Nissan Qashqai (-27%) and Opel Astra (-42%) implode. The Volvo V90 slips out of the Top 10 (#13), the Volvo XC60 is up 10 spots on June two #14, the Toyota RAV4 up 38% to #16 and the BMW 3 Series up 66% to #22. Full July 2017 Top 30 brands and models ranking tables below.